This new and exciting tool enables precision cordless engraving anywhere by anyone. Users can protect all types of valuables with identifying markings and even perform delicate personalization of items. 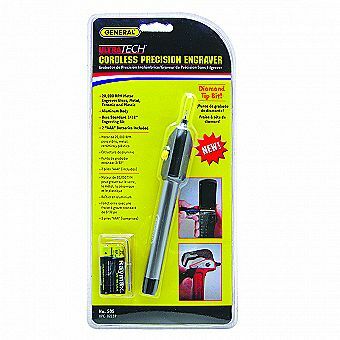 The engravers powerful 20,000 RPM motor is powered by just two AAA batteries and the diamond tipped bit enables engraving in glass, metal, ceramic and plastic. An aluminum body offers superior durability and the one of a kind tri-lobe ergonomic grip provides the ultimate in comfort and ease for use.